Penelope Boston, the director of NASA‘s Astrobiology Institute, and her team have spent years exploring Mexico’s Naica Mine in Chihuahua looking for extremophiles, which contain caves as large as cathedrals. 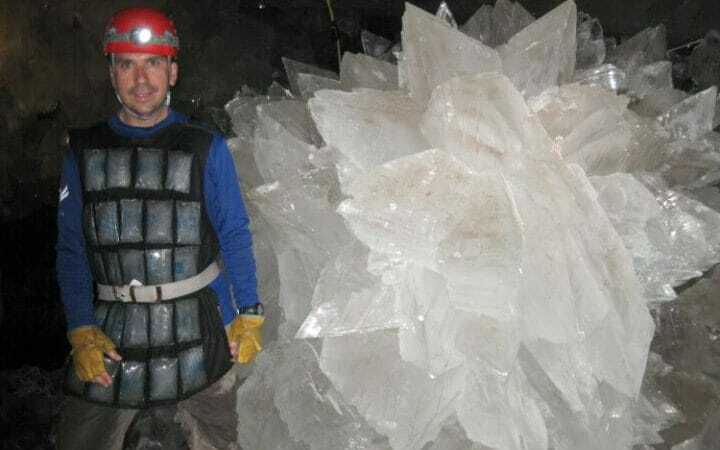 The mine is filled with giant gypsum crystals which look so extraordinary that when Dr Boston first saw a picture, she assumed it had was a Photoshop hoax. But more astounding, was that inside the crystals, tiny bugs were discovered in a state of ‘geolatency’ – where living organisms remain viable in geological materials for long periods of time. Around 100 different bugs, which were mostly bacteria, were found inside crystals, where they had been trapped for between 10,000 and 60,000 years. 90 per cent had never been seen before. The cave system sits above a large pocket of volcanic magma and is geothermally-heated to temperatures of up to 60C, which has led to astrobiologists dubbing it ‘hell’. Most life could not survive there but scientists have discovered some organisms have evolved to feed on the sulphides, iron, manganese or copper oxide in the cave. “They’re really showing us what our kind of life can do in terms of manipulating materials,” said Dr Boston. Some of the “sparkling white” giant crystals are as long as five metres. “I can’t even put my arms round the biggest ones,” she added. Other caves detected with “weird life forms” but accessing them was too dangerous. Scientists said discoveries such as this raised the possibility that dangerous bugs could hitch a ride back to Earth when spacecrafts return from other planets. NASA has plans to bring back rock and ice samples from Europa, an icy moon of Jupiter, which is one of the best targets in the solar system for life because it has a salty ocean beneath its crust. Dr John Rummel, from the Seti Institute in Mountain View, California, said it was “pretty easy” for bugs to survive space journeys as long as they are shielded from the sun’s ultraviolet radiation. “If we bring samples back from either Europa or Mars, we will contain them until hazard testing demonstrates that there is no danger and no life, or continue the containment indefinitely while we study the material. “It is assumed that such life would be hardy – to survive the trip to Earth; not easy – and precautions taken would provide a very high degree of containment.